Cleaning and sanitizing your brewing equipment is an important step in preventing your creations from getting infected and spoiling your end product. After all that effort and patience, you wouldn’t want to suddenly find your brew to have a funky, foul taste. The process of brewing is all about fostering the growth and prosperity of certain microscopic organisms. But they have some nasty rivals that like to grow in similar environments. In order to hinder those little nasties, it is critical that you take proper precautions in caring for your brewing gear. You should do this both before you begin using, and after you’ve finished with the tools. Always wash your equipment first. This will remove any large contaminants that could harbor microorganisms in its nooks and crannies. Oxiclean – This is widely available, and fairly inexpensive. It is good for cleaning off all the residue found in your fermentor. Powdered Brewing Wash (PBW) – A stronger solution that can remove most organic residue buildup with a minimal amount of scrubbing. It’s a bit more expensive and not as readily available, but it good on tough stains. Straight – A – Another strong, specialty cleaning solution. Dish soap – Cheap and readily available. It can get the job done. Just make sure to completely rinse it all off your equipment. Bleach – While it does make for a good disinfectant, I would avoid using this at all costs. It requires a ton of rinsing to be sure you’ve removed it all. Bleach has a lingering, strong smell you wouldn’t want near your brew. It can actually corrode stainless steel, increasing the areas of your equipment that bad things could hide in. And if that’s not bad enough, if it happens to mix with the yeast nutrient, DAP, it can create poisonous chlorine gas. So, really, there’s very few upsides to using bleach to clean your equipment. Pretty much anything else would be better. Be careful when scrubbing plastic, as you don’t want to scour scratches into the material. This would give microorganisms another hiding place. Plastic should also not be soaked for an extended period of time in these solutions, as it can sometimes absorb some of the chemicals involved. We wouldn’t want these to seep back into our must. Now that we’ve cleaned everything, it’s time to sanitize. We’ve removed the obvious soil from our equipment, but there’s still some small microorganisms crawling around on it. This is where our sanitizer comes in. These create an inhospitable environment for the germs after a brief exposure and ensures our yeast will not have much competition when we go to use this equipment as their new home. Make sure to sanitize any of the tools that will come into direct contact with your must. Starsan – This is the go to for most homebrewers when it comes to sanitizers. It is fairly inexpensive, easy to use and can be found readily in most homebrew shops or online. It comes concentrated, so requires mixing with water. A small amount can be used sanitize all your equipment at once. 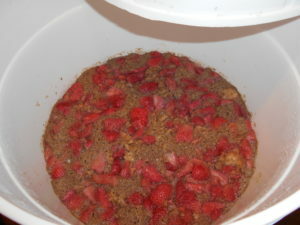 Many homebrewers will fill up their fermentation bucket, add some Starsan and dunk the rest of their tools in there. Starsan only requires about 60 seconds of contact to do its job. Placing some solution in a spray bottle makes for an easy to use quick-sanitize option for those small, or oddly shaped tools. Another cool thing about Starsan, is that it does not require rinsing afterwards. The yeast will actually eat it, and cause no adverse effects to your mead. So don’t worry about leaving a little of the foam behind. Be aware, that it is slightly acidic. Don’t leave puddles of it sitting around. I have a few rings on my counter from the acid discoloring the surface. A quick wipe down when you’re finished should prevent this from happening. Iodophore – An iodine based sanitizer that requires only a small amount mixed with water. It is similarly fast acting, taking just 60 seconds of contact. Metals should not be kept in contact for an extended period – it can pit the metal similar to bleach. B-Brite – Another common sanitizer found in homebrew stores. This one comes pre-mixed, but requires about 15 mins of contact to be effective. Boiling – Boiling water can be used to sanitize some of the tools you have that can survive high heat. Oven – Not the most time efficient method, but a dry heat can be used to kill off ALL microorganisms. The higher the temperature, the less time the items have to be kept under this heat. 250 degrees F requires 12 hours, 338 degrees F 60 mins. It’s the only option that will completely sterilize your equipment, rather than just sanitize it. It’s just not the most convenient one. Dishwasher – A full cycle in the dishwasher is enough to sanitize your equipment. The steam in the dry cycle can be quick effective at this. Be careful of any plastic items, as they can warp under the heat.